I surely seem to have a bovine connection. I say this not just because out of the three dogs of mine, one used to eat banana peels whenever she got the chance, and the other keeps doing it in the present. When it happened the first time and I recounted the same to The Nuts, they suggested as friends are wont to, that I go back home and make sure it wasn’t a calf I was bringing up. Jokes apart, seriously, the cows/bulls and I seem to have a thing going. My first memory is of the one(s) in the cowshed behind our ancestral home in the village. Placid creatures with huge soulful eyes whom we occasionally hand fed choice delicacies like fresh green grass, or pulled loads of hay off the haystack and filled feeding troughs. Not that the fact made them seem any safer to me. They were on the other side of the half-wall and I on this side, and I was content to let these clearly drawn lines of separation remain so. For the next few years the relationship between us remained one of utmost respect, that is, on my part. Whenever I met one of them on the road, I let them have right-of-way and making it as casual as I could, I hurried over to the other side, putting distance between us. Desist from that judgmental thought that slipped into your minds right about now, that I was avoiding the ‘poor’ things. Far from it. Since they never said a word to me, but made a point to occasionally shake their heads ominously, showing off pointed horns, I gathered that they’d rather not have my company inflicted on them. And as you all know, I stay away from those who do not want me. Such then remained things when they next did quite the unexpected. I mean, here you have them looking balefully at you for years, impressing upon you to keep your distance and the next thing you know they are occupying your dreams. Unfair, if you ask me. What the hell were they doing there anyway? That too when I was busy cramming the brain with the necessary stuff for the school leaving exam. Three of the tests were done and there were three more to go, when over the weekend that came in between, a bovine gathering of three decided my dreams was THE place to be for them. Not content to make an appearance, they spiced it up with their favorite act of shaking their head (those scary horns!) at me. One of them was really antagonistic, bent on injuring me, the other not so much, but threatening enough; the third it seems couldn’t care less and was seen chewing the cud in a bored way. the exams to follow? A sort of prediction? Surprise, surprise! The next three followed the same pattern too. One was easy (Social Studies! ), the other was okay and the last was so tough that it had students coming out of the exam hall sobbing their hearts out. Obviously not I though. Catch me crying over exams or serious things like that. After a couple of years of plodding around in my dreams at their will, one fine day they vanished. The next few years we went back to maintaining the cordial but distant relationship as before. But things seem to have changed recently with them whatchamacallits suddenly going proactive. I was out with my camera trying to get some nature pictures on a visit to my parents when I saw a calf come bounding. I focused the camera intending to take a few snaps of the sweet thing when I noticed it wasn’t stopping, but was making straight for me with determination. Alarmed I jumped back to a safer distance. Did I hear someone say it was only a calf? Ha. Little do you know the sinister agenda of calves [link] My sister appeared on the scene just then and offered the calf some grass, but it would have none of it. Its eyes were trained on my camera. A fortnight ago, the L & M and I were at Kappil. It is a place I have always seen from afar, while inside the train going to and from Trivandrum. Finally I could make it there and soak in the natural beauty. In the distance I could see a train snaking along the opposite bank towards a bridge. It was a beautiful sight. I hurried towards the water’s edge to get a better view when I saw a black and white lift up its head and eye me. I felt uneasy, but continued on my way. The cow followed me. At first I thought it was my imagination, but no, it was making for me but via a slightly more circuitous route. 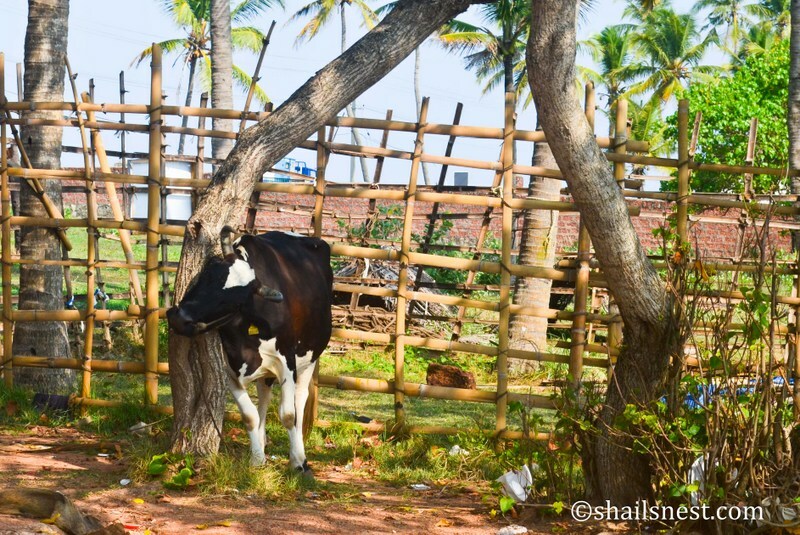 An intelligent bovine, apparently, it pretended to scratch its back against a tree, all the while eyeing me surreptitiously. That it had something brewing in its head was a given and that I figured prominently in that something was another given. 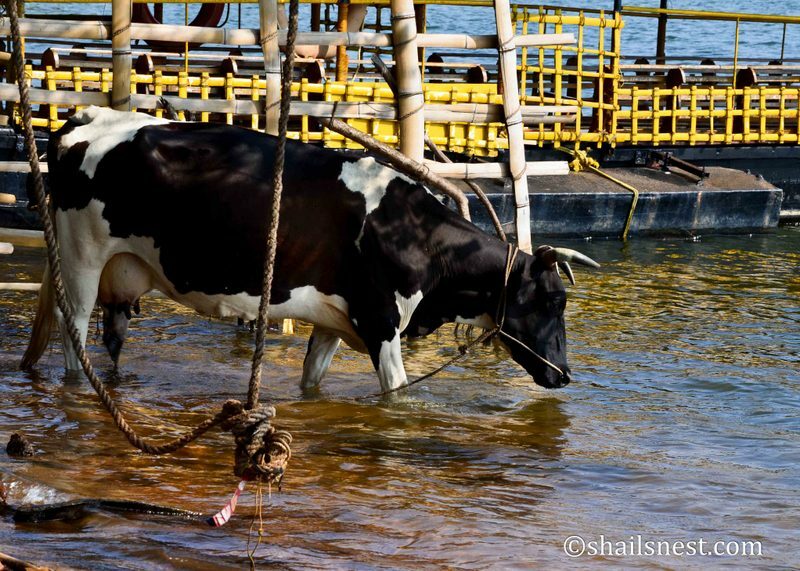 How the hell was I going to keep my eyes on the cow as well as get a picture of the train and the lake? I sought the L & M’s help. Please watch my back while I take a couple of pictures, I told him. Phew. It is such a relief to have someone look out for you while you go about your work. 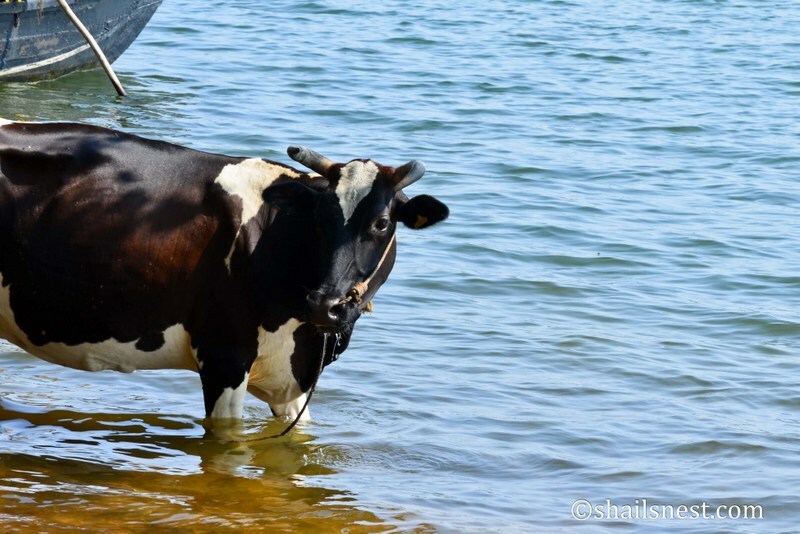 The cow meanwhile moved to the water’s edge, parallel to me, on the pretext (yes, pretext!) of drinking water. It made a show of drinking some and then stepped around a bit, going plop-plop in the water with its hooves, and then it turned to gaze soulfully at me. I took a few quick pictures of it. By then, I was getting this eerie feeling the cow was about to start talking to me, or maybe it was planning to suddenly charge at me. L & M or no L & M, I quickly put the camera away into my backpack and hurriedly withdrew, urging the L & M to do the same. I have a sneaking suspicion that it is my camera that this cow was after too. Now who would tell the lot this, the camera is of no use to them per se, but if they posed at a safe distance without scaring me, I’d only be too glad to take any number of pictures of theirs?! For free, too. Nice cow stories! So you believed in 3 cows in your dream signifying something during your exams! We believe in everything during our exams! 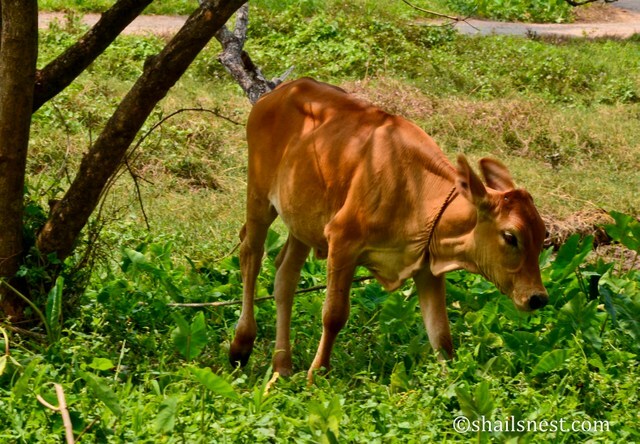 I am always careful when cows or their cart pass me on the roads, since once one of them wagged their tail and hit my face, while ‘walking’ slowly…I can feel the pain and stench even now! Another peppy post from Shail’s ‘tijori’!